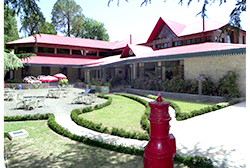 The present Kasauli Club was established as “ The Kasauli Reading and Assembly Rooms in 1880. On 01 Jan 1898, it came to be known as Kasauli Club” by a resolution passed on 07 May 1897 wherein it was stated that the management of the Kasauli Reading & Assembly Rooms being unsatisfactory it was desired that the Management should be in the hands of army officers & civil servants residing in the Cantonment. As empires were being built, the Kasauli Club prospered and went from strength to strength. Other than the bars, library, billiard room, the Club boasted of six Tennis courts. A leveled shelf served as the grand stand above the courts to allow the spectators a view of the tennis while nibbling on their cold cucumber sandwiches at tea time. Life was as its zenith. Quickly, the Club established a reputation for good food, good drink and a smart social circle. It became a central focal point for people meeting in the Shimla hills. Residential quarters were constructed to facilitate out of towners. Kasauli vied with Shimla for importance. It could not claim to be the hub but it was most important spoke in the Raj wheel. Easily accessible from the heat, dust and water starved plains, Kasauli offered cool air and a smart elite social set up. These are exactly the reasons; Kasauli is so sought after even today..
Col ML Ahuja was the first Indian Chairman of Club Management Committee of independent India, who was instrumental in saving the Club from being sold off in 1947. Maj (Later Maj Gen) Mohinder Singh Chopra was amongst the first Indian members of the Club. The new look Club was inaugurated in 2001. However, it was destroyed by fire in Jan 2002, but was rebuilt with active participation by all the members and re-inaugurated on 27 Mar 2005. The finishing in its resplendent glory is a testament to the stellar work & the spirit of the managing committee, members & staff of the Kasauli Club. From a humble beginning, today the Kasauli Club has become an institution of the most elegant, famous and sought after Clubs in Northern India.